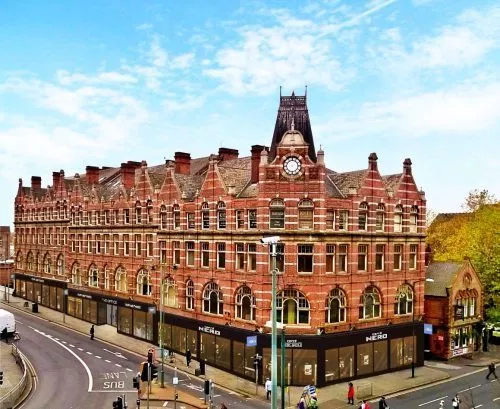 Property consultancy FHP announced at MIPIM last week that it has acquired the landmark City Buildings in Carrington Street from Nottingham City Council on behalf of clients. David Hargreaves of FHP said: “City Buildings is an iconic building on the approach from the railway station to intu Broadmarsh Shopping Centre. It is often referred to as the Redmayne and Todd building after the Nottingham sportswear retailer which occupied the corner site in the eighties and nineties. Nottingham City Council marketed the site in early 2018 and after going through a couple of ‘beauty parades’ an offer in excess of £4m was accepted from Shoby Investments. David Shelton of Shoby Investments said: “We have bought a number of trophy buildings via FHP over the past couple of years and this could be the best of them all. It is a stunning building in a rapidly improving location – with the redevelopment of Intu Broadmarsh now underway, the new bus station and car park and the recent announcement of the pre-let of 260,000 sq ft of Unity Square to HMRC. John Proctor of FHP, who will be marketing the offices, said: “We are delighted to have secured this fantastic building for clients who are a local Nottingham family company which is going to provide up to 30,000 sq ft of much needed speculative offices so close to the station.